Add to the success of your commencement ceremony with light blue graduation stoles over your gown! Honors Graduation offers these beautiful mementos at highest quality while remaining the most affordable price, thanks to our bulk discounts and low pricing. 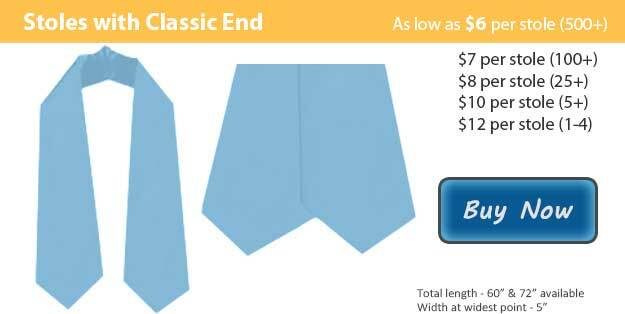 Our light blue honor stoles are made with highest quality crepe back satin. These attractive additions to your school's graduation wear will certainly last as treasured keepsakes for years to come! Students may be presented with light blue honor stoles for a variety of purposes. Students may be given an honor stole with honor cords to indicate particularly high honors in grade point average. Others may be given light blue honor stoles to indicate their participation in particular organizations or leadership positions. Additionally, particularly if light blue appears in one of your school's colors, you may choose to present light blue honor stoles to all of your students for the symbolic tradition known as a "stole of gratitude." In this tradition, students wear their stoles throughout commemoration. Following the ceremony, each student gives their graduation stole to a mentor who has helped them achieve the accomplishments of the day. You can feel confident that whatever the purpose of using your light blue honor stoles, they will contribute to your graduation ceremonies! The color of light blue also garners its own meaning that can add to the ceremony's significance. It can be associated with health, healing, tranquility, and understanding. Some of these attributes may be elements of your school's mission statement, so their presence in the graduation wear could be powerful during commencement activities. Additionally, in the presentation of degrees, light blue indicates achievement in education. These symbolic meanings can further add to the dignity of your ceremony. Order your light blue honor stoles with Honors Graduation today, and remember to ask about our bulk discounts!